No, that is not a typo. The Illinois Association Of Realtors released November sales data today and home sales in the greater Chicago area were up 71.6% over last November! The graph above shows the trend over the last 4 years and what has happened in the last couple of months is incredibly dramatic. Not only did November surpass 2008 but it also surpassed 2007 – by a lot. No doubt this is the result of the home buyer tax credit, which is certainly pulling demand forward. Remember that the original credit was to expire at the end of November, so everyone who wanted to get in on it had to close by the end of November. Those wheels were already in motion when the government decided to extend the credit. However, the demand has already been pulled forward by several months and there should be a demand vacuum for the next several months – offset partially by the new demand that is being pulled forward by the extension of the tax credit. But sooner or later the music is going to stop and it could be cash for clunkers all over again – i.e. volume will crater. 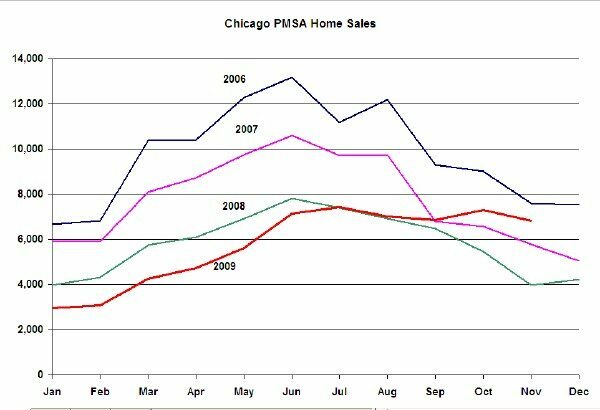 Nevertheless, there are several positive signs in the Chicago housing market, including an 8% improvement in home prices since the trough. As always, you can find this and other key Chicago area housing statistics on our Web site.